An entire generation could probably hum the music for this addicting game. It rang through halls of arcades and in the back of bars for fifteen years, and was integrated onto just about every major videogame system since. It is one of the first games that are put on phones and tablets, and shows no signs of going away any time soon. We will take a nice stroll down memory lane and take a look at the game’s origins, some great Mario cameos in Tetris, and where the game is going next. The puzzle game sensation from Russia just got portable on the Nintendo Game Boy. With 20 progressive skill levels to cater for beginners to hardened veterans this game is fast action and gives no time for hesitation, you can even pick the music that plays while you play. In the two player mode of Tetris one player will be Mario, the other will be Luigi, and an Icon of their head will appear in the top right hand corner of the game screen. When the game ends the losers character will be crying and the winners character will be jumping up and down. The basic premise of Tetris is that the game rains tetrads, or four block squares, and the player has to arrange them so that they form solid lines. Once the player manages to make an entire row of the blocks line up perfectly in a solid form, the row disappears and the player is awarded points. This game had a very rich history by the time that it was ported onto the Nintendo game systems. 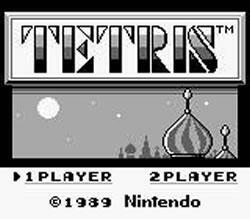 Before it ever had the likes of Mario cameos in Tetris, it started out as a conceptual game in 1984 by Alexey Pajitnov. It was released on the IBM PC and then on MAC not long after. Before long, it was released on the arcade systems where it experienced an explosion in popularity the likes were never seen before. People would line up to challenge and beat one another’s scores while discussing different strategies for getting to higher and higher levels. One of the things that are most difficult to understand about Tetris is how something so simplistic could be so engrossing. People have played this game for decades and still come back for more. The basics of the game are simple enough to understand. The game has constant falling blocks that must be fitted together on the bottom of the screen in order to form a solid line, at which point the line disappears, the player is awarded points, and the blocks above fall into their place. This requires an expert hand at fitting puzzle pieces together and determining the right time to clear a line. Since the tetrominoes are four blocks, they each hold the ability to clear more than one line if they are implemented at the right point. This means that the player’s goal should be to line up as many rows as possible before dropping the piece in to fit. 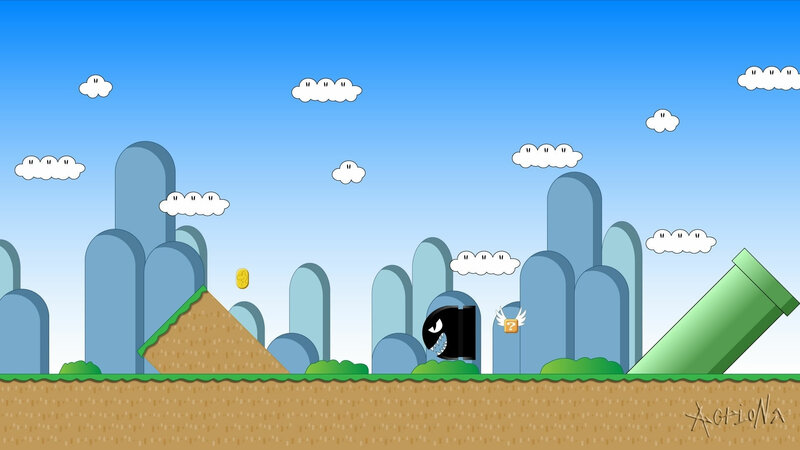 The game is over when the player has cleared a stage or has lost the game by allowing the blocks to accumulate so high that they reach the top of the screen. This can happen by accidentally dropping pieces into the wrong place, or if the game speed overwhelms the player before they are able to properly place the piece. 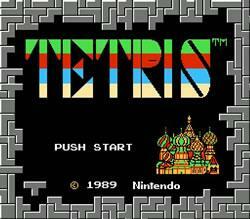 Back in the old days when games were hard and 8-bits were something to be proud of, Tetris did not have a save battery. This means you played until you lost, and then started over again. Later incarnations of the game had a code that you could start at certain levels, but that was to give siblings a chance and not for real gamers. The game blocks are broken down into seven different shapes. The long, straight “I” piece will be your best friend throughout the entire game. It can comprise a long piece or serve as the best way to clear four lines at a time, optimizing your score. It is also these easiest way to get a “Tetris” by clearing four lines at once. The other blocks mimic shapes much like the “I” shape, and they are J, L, O (A square), S, T, and Z. They fall through the Tetris field at random, and require a large amount of strategy in order to manoeuvre them properly. There are generally two different game modes that you can play on the Nintendo Entertainment System and Gameboy. The first is playing single player and the other is multiplayer. Type A: Type –A Tetris was the most basic form of gameplay to be offered. You simply played endlessly until the game eventually overwhelms you. Type B: Type-B is also called “sprint mode”, and your job is to get the amount of lines that are required as fast as possible to advance to the next stage. Type C: This is one of the more difficult versions of Tetris because after you play a certain amount of pieces, random blocks will appear beneath your lines. This will make your game much more interesting as you try to fill the gaps and get pieces to work for you. Single Player: The goal of this game is to continue to clear the levels by getting the highest score possible. As the stages get harder, the blocks continue to fall faster, giving you less time to work with the blocks before they fall. The game ends when you complete the levels or the blocks overwhelm your screen. After you get to certain levels, like Stage 9 Level 5 in Type B mode, you will be rewarded with a Mario cameo on the Nintendo Tetris. Aside from Mario, there are many other characters such as Luigi, Link, and even Bowser who come out to congratulate the player. Multiplayer: In this mode you go head to head with another player until one of you loses. 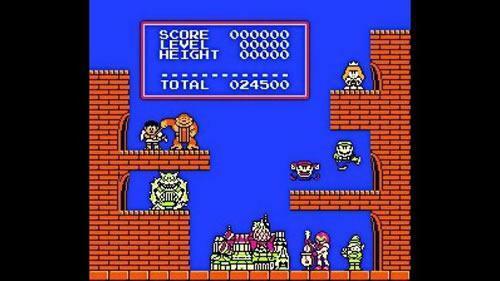 On the Nintendo version you would play one person at a time on the two player mode. On the Nintendo Gameboy version, you would play head to head using the link cable. There are many character cameos in this game, with the most famous being Mario on the Nintendo version. He appears at Stage 9 Level 5 in Type B mode, along with many others as they dance while the rocket takes off. Luigi is also present on the dancing level, with Princess Peach at the top of the castle. Link and Samus are playing instruments in front of the Kremlin Palaces. Bowser is being his evil self on the opposite side of the screen, along with Donkey Kong. It is worth noting that the Mario cameo in Tetris on the Nintendo has one of the funniest looking sprites besides from his appearance in Zelda. Once you beat level 9 on Game B on all the difficulty settings you unlock a special scene featuring various Nintendo characters including Mario, Luigi, Link, Samus, Pit, Bowser and Donkey Kong; and they're all dancing to celebrate your victory! In December 1994 in the USA Tetris was re-released with another popular puzzler on one cart - Tetris & Dr. Mario for the SNES. This epic combo cart would follow in Europe on July 25th, 1995 but curiously did not get released in Japan - quite surprising considering the popularity of such puzzlers over there at the time. Easy to pick up, impossible to put down! 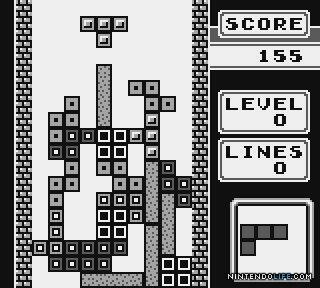 TETRIS, the iconic block-slotting puzzle game, gets a re-release on the Nintendo 3DS system. It’s easy to pick up, yet impossible to put down. Create solid horizontal lines by deftly maneuvering the falling Tetriminos into place. Clear as many lines as possible before the screen is overrun with Tetriminos. Work your way up from the easiest setting or crank up the speed to increase the challenge. Either way, you’re in store for hours of entertainment – all over again. 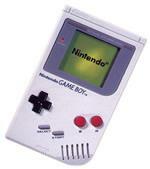 It was the first game on the Gameboy to use the link cable system, paving the way for future games. Tetris was a game made in the Soviet Union, which explains all of the unique buildings. Tetris was the first game to be played in space! 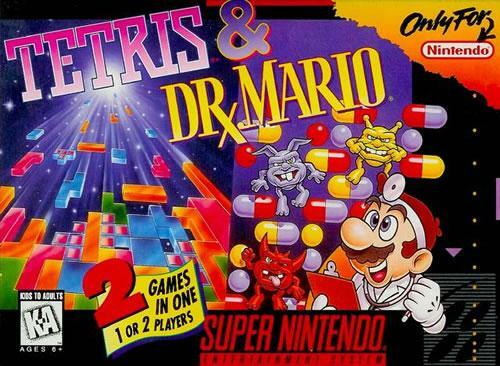 Tetris was packaged with Dr. Mario on the Nintendo. Tetris is one of the most wildly successful games of all time. It has been sold on more platforms that any other game, including mobile phones where is has been sold over 100 million times. It has been noted as one of the most challenging games and the best way to stay occupied between appointments. It has been rated as one of the best games of all time by many magazines and game review sites. Tetris is fun, addictive, and constantly being re-imagined with interesting features that make it as relevant today as it was decades ago. The IBM version of Tetris was called "One of the most addictive computer games this side of the Berlin Wall" by Compute! In 1989 Tetris won the Compute! Choice Award in the arcade game category was was cited as "by far, the most addictive game ever"
Tetris even made it to the Guinness book of world records as being the most ported videogame in history. In 2011 the game had been ported to an astonishing 65 different platforms including phone apps, consoles, pc's.